BACKGROUND: Dermatological patients quite commonly depict psychiatric morbidity. PURPOSES: To study the psychiatric morbidity among skin patients of our clinic. METHODS: In the present study, the patients who were treated in the Dermatology Clinic of Inonu University Medical Faculty were evaluated retrospectively. The age, gender, marital status, habits, dermatological and systemic diseases, previously used drugs, current therapy and psychiatric diagnosis of each patient were recorded. FINDINGS: Of 636 patients involved in the study, 15.3% had psychopathological problems, which were depression (32.0%), adjustment difficulty (15.5%), anxiety (13.4%), psychosomatic disorders (10.3%), obsessive-compulsive disorder and conversion (5.1%), dysthymic disorder (4.1%), attention deficit and hyperactivity disorder (2.1%), panic attack (1.0%), premenstrual syndrome, schizophrenia, somatization disorder, insomnia, alcohol dependency, bipolar affective disorder, mental retardation, agoraphobia, social phobia and dementia. The dermatological diseases defined for the patients with psychopathology diagnosis were chronic urticaria (25.8%); psoriasis (15.5%); alopecia areata, totalis and iniversalis (11.3%); acute urticaria, neurodermatitis and Behcet's disease (5.1%); atopic dermatitis and drug eruptions (4.1%); pemphigus (3.1%); angioedema, contact dermatitis and generalized pruritus (2.1%); folliculitis and the others (1.0%). 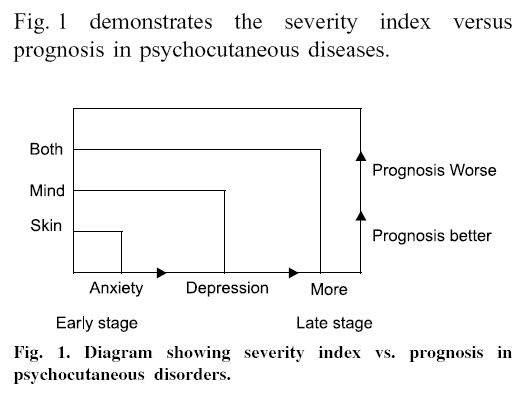 CONCLUSIONS: Psychiatric morbidity has an affect on the course of dermatological diseases. When required, psychiatric consultation should be sought by dermatology clinics and patients should be followed with the cooperation of dermatologists and psychiatrists. LIMITATION: The indoor-based study had not included any control group and any domicillary patient. BACKGROUND: Leprosy, being a chronic infectious disease with profound social stigma, remains associated with high psychological mortidity. PURPOSES: To find out the pattern of psychiatric morbidity in leprosy patients and the relationship of various factors with the morbidity. METHODS: Ninty patients attending leprosy clinic were randomly chosen for the study group alongwith 40 patients suffering from acute skin problem other than leprosy as control group. The socio-demographic data were recorded in semi-structural proforma; all patients were given Goldbery Health Questioneaire (GHQ). Patients having GHQ score >2 was assessed by Disability Assessent Questionaire (DAQ). The psychiatric diagnoses was made according to ICD-10 by W ho0 and physical deformity by W ho 0 Disability Scale. FINDINGS: The mean GHQ score of the study grant was 3.44 and that of control group was 1.62. The mean DAQ score was 45.13. Psychiatric disorder was seen in 44.4% and 7.5% of study group and control group respectively. The psychiatric illness was generalised anoxidy disorder (GAD) (27.8%). CONCLUSIONS: Leprosis highly associated with psychiatric mobidity. LIMITATIONS: The findings can not be generalised due to small sample size and clinic-based data. 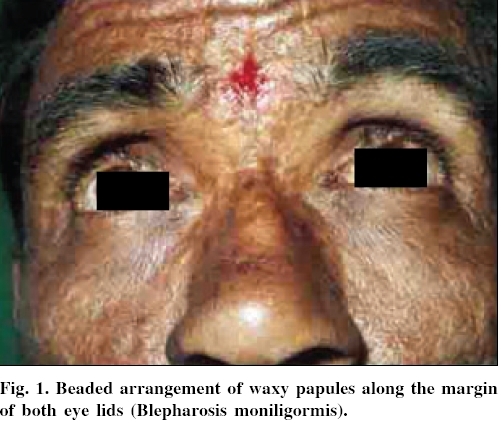 BACKGROUND: Melanocytic nevi show different presentations in children which have not much studied in India. 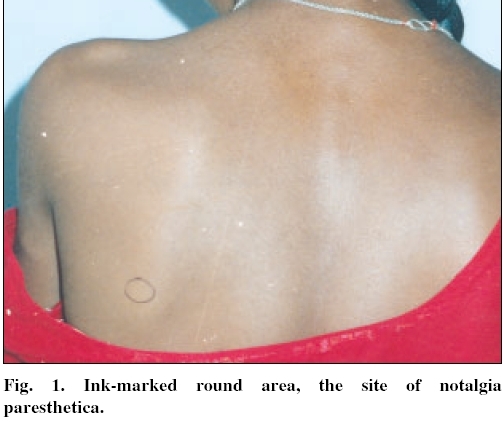 PURPOSES: To document the incidence and pattern of melanocytic nevi in children. METHODS: A total of 4,256 paediatric cases attending the dermatology OPD, JIPMER during the study period from August 2002 to August 2004 were screened for melanocytic nevi. 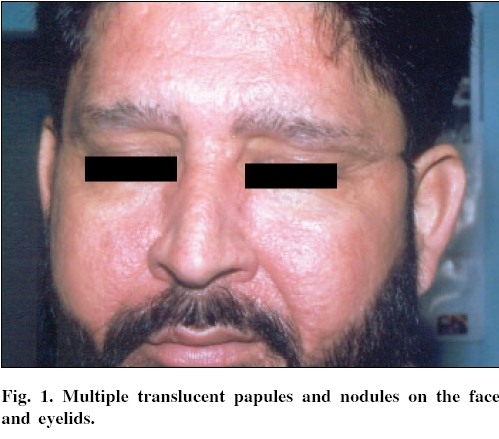 FINDINGS: Out of these, 41 (0.96%) cases were found to have melanocytic nevi. The mean age of these cases was 1.4 years (range of 3 days to 14 years). Fourteen (34.1%) of them were males and 27 (65.9%) were females with male to female ratio of 1:1.9. Majority of these cases (32 cases, 78%) were in the age group of 0-1 year. Thirty-seven (90.2%) cases had single lesion and 4 (9.8%) cases had multiple lesions. 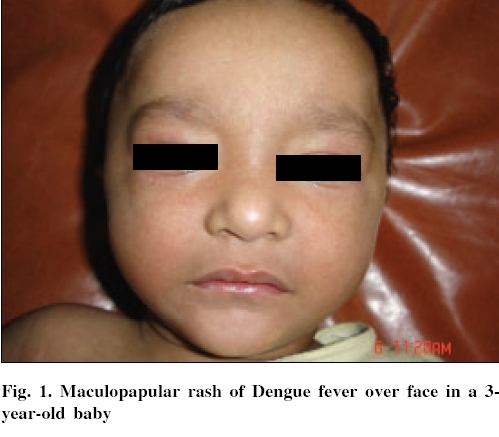 The size of the nevi varied from 1.5 cm to 20 cm in 40 (97.6%) cases and more than 20 cm in 1 (2.4%) case. The most common site of involvement was the back (32 cases, 78%) followed by head and neck (6 cases, 14.6%). 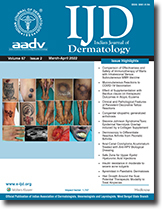 Out of the total of 41 cases, 30 (73.2%) were Mongolian spots, 8 (19.5%) were congenital melanocytic nevi, one case (2.4%) each had giant congenital melanocytic nevus, nevus spilus and nevus of Ota. 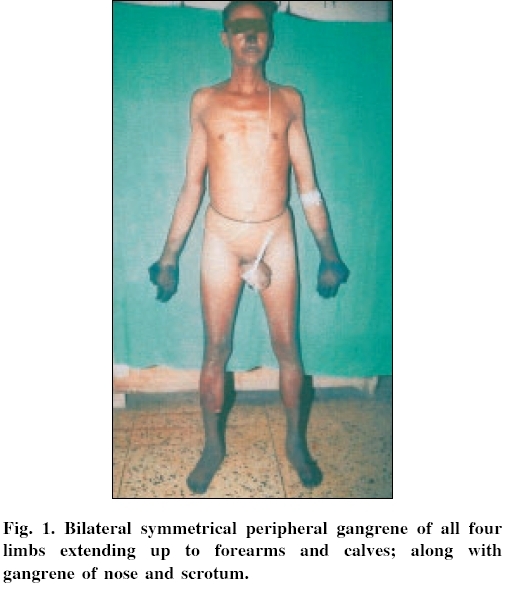 Four cases had other associated cutaneous disorders. 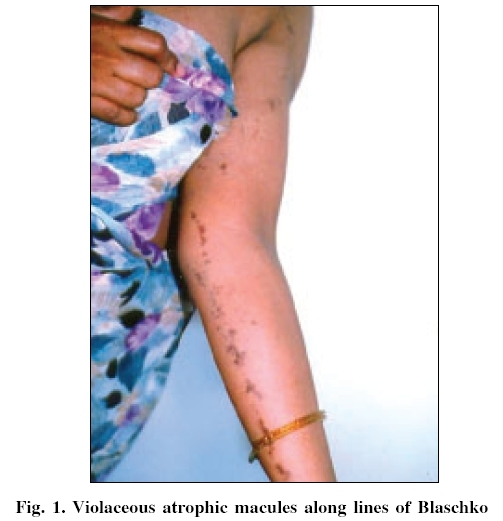 These included ashleaf macules in 2 cases, epidermolysis bullosa simplex in 1 case and a solitary case had both cafι-au-lait macule and mixed hemangioma. 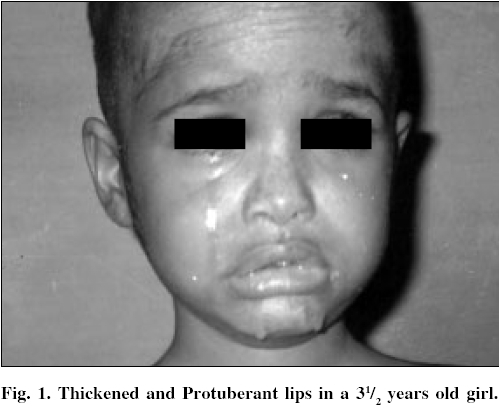 The systemic associations included seizures (suspected neurocutaneous melanosis) in a solitary case of congenital melanocytic nevi. CONCLUSIONS: The spectrum of melanocytic nevi seen in children in this study partially differs from this of abroad studies. LIMITATION: Unicentre hospital-based study which cannot be generalized. BACKGROUND: Due to recent industrialization and inadequately protected workers or in other words poor supervision on constructive workers habits in our large city of Isfahan cement contact dermatitis is relatively high especially among cement factory workers and constructive personnel. PURPOSES: To investigate the prevalence rate of cement contact dermatitis in cement factory workers in Isfahan. METHODS: A case-control clinical study was carried out by randomly selecing 150 factory workders and 150 official clerks in a cement factory in Isfahan in 2001. After a complete physical examination, data was recorded in observational checklists. FINDINGS: The percentages of contact dermatitis prevalences in the first and the second groups were 22% and 5.3% respectively. About 60% of cement workers with contact dermatitis were between 30-40 years of age. There was a direct relationship with age in both groups of the workers. In the high-exposure group, the hand eczema along was 70% but in the other group the percentage of involvement was the same in exposed and unexposed anatomical areas. CONCLUSIONS: There was a direct relationship between occurrence and the severity of involvement and duration of contact in the first group. Cent percent of cement workers had contact dermatitis after 10 or less years, but the percentage among the other group was 35%. LIMITATION: Irritant contact dermatitis to cement has not been detected. BACKGROUND: Atopic dermatitis is a chronic recurrent genetically determined skin disease affecting all age groups. PURPOSES: To study epidemiological and environmental factors, clinical patterns and the relationship of atopic dermatitis with ABO blood group system. METHODS: In 30 atopic dermatitis patients blood group distribution was compared with the distribution in 1500 relative donors of the blood bank of the same institute. FINDINGS: There were 18 males (60%) and 12 females (40%). Family and personal history of atopy were observed in 21 (70%(and 19 cases (63.3%) respectively. CONCLUSIONS: Blood group O subjects were significantly less in the study population in comparison to control. LIMITATION: Hospital based study with small sample size; hence the result cannot be generalized. BACKGROUND: Palmoplantar dermatoses often show therapeutic problem. PUVA therapy represents an effective remedy for refractory dermatoses. PURPOSE: To evaluate the response of palmoplantar dermatoses to PUVA therapy. 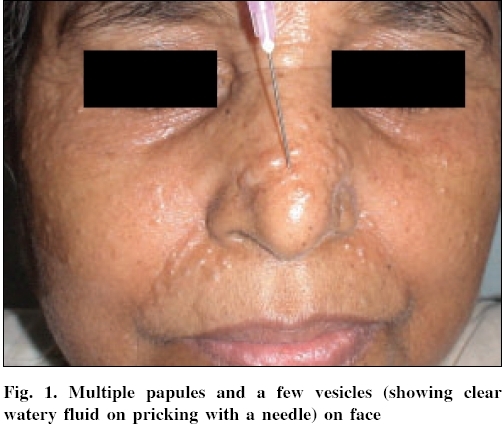 METHODS: A propsective study undertaken on 50 patients from the Outpatients Department of Dermatology in Dayanand Medical College and Hospital, Ludhiana to study the effect of PUVA therapy in plamoplantar dermatoses. 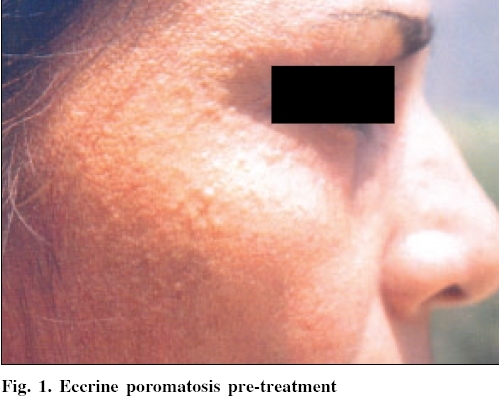 Out of the total of 50 patients, 26 patients (52%) had chronic plaque psoriasis, 19 patients (38%) had vitiligo (acrofacial variety) and 5 patients (10%) had lichen planus. Each patient was given PUVA therapy 3 times of week on alternate days for 6-12 months or remission whichever was earlier and then followed up for 6 months. RESULTS: About 62.5% patients of psoriasis, 55.5% of vitiligo and 60% of lichen planus showed improvement. Main side effects were nausea and erythema (20%). PUVA Therapy had to be stopped in one patient due to flaring of psoriasis. After six months of follow-up, 60% of patients were maintained in remission in psoriasis; none of the patients of vitiligo showed any loss of pigmentation; and, all the patients who showed improvement in lichen planus were maintained in remission. CONCLUSION: PUVA Therapy is a successful treatment for plamoplantar dermatoses like psoriasis, vitiligo and lichen planus. LIMITATION: Open study having no control and small sample size. Three cases of dermatitis artefacta are reported for their varied presentation, diagnostic indicators and complex management. 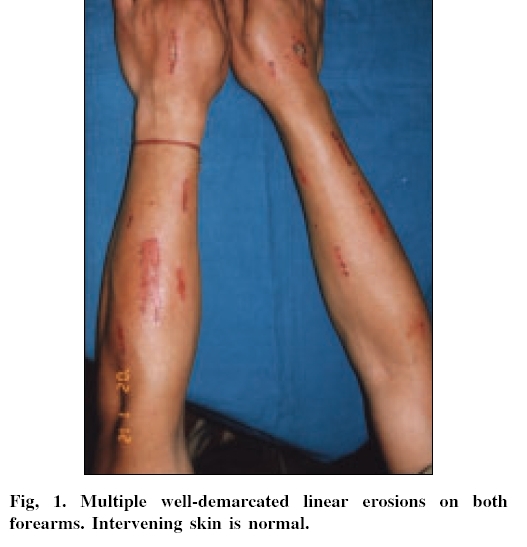 A 21-year-old soldier had multiple painful erosions on dorsum of both forearms of three weeks duration normal with inbetween skin. 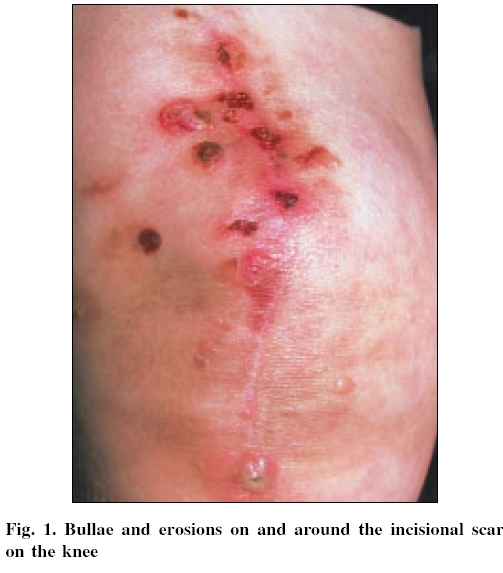 By occlusive bandaging dressing lesions healed without recurrence. A 28-year-old mechanic had recurrent blisters with non healing wounds on the right knee without surrounding inflammation. Histopathology was nonspecific. A young soldier had multiple asymphomatic nodular lesion in linear distribution on right forearm of two years induration. Biopsy showed features of scar. Psychiatric evaluation and follow-up was essential in all cases. Linear lichen planus along the lines of Blaschko is uncommon. 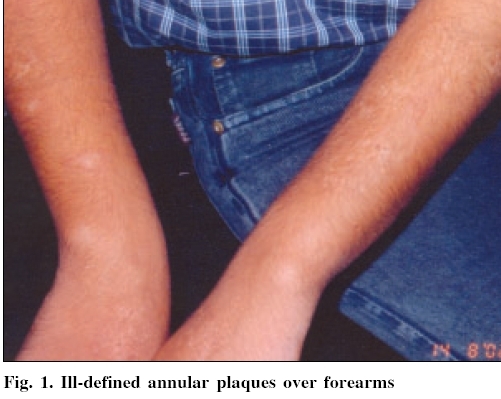 Atrophic lichen planus is usually a sequel to resolving annular and ulcerative lesions. We herewith report a case of histopathologically proven lichen planus, presenting with atrophy at the outset, in a linear distribution along the lines of Blaschko. 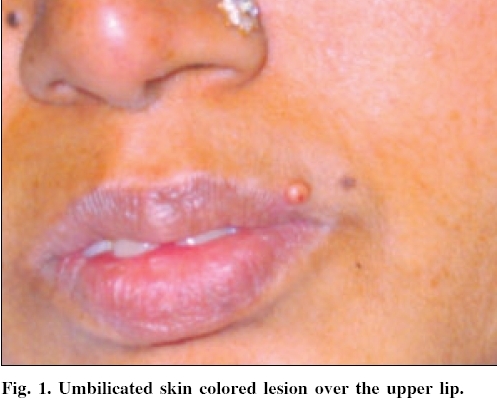 In addition to the cutaneous findings, she also had pain along the distribution of lesions. Annular elastolytic giant cell granuloma is a recently described entity of unknown origin that presents as indolently growing papules and plaques over sun-exposed skin. Histology shows a granulomatous infiltrate with loss of elastin in the center of the lesion. We came across a patient who had penile lesions and a paucity of literature about the involvement of the external genitalia in this disorder. Lipoid proteinosis denotes a rare autosomal recessive disorder. We report here lipoid proteinosis in a 31-year-old unmarried female along with her sibling. She had hoarseness of voice along with multiple asymptomatic warty papules over face, neck and extremitis with similar findings in one of her siblings. Laryngoscope showed beaded deposits over epiglottis and vocal cords of both patients. Biopsy showed PAS-positive homogeneous eosinophilic materials in upper dermis. Lipoid proteinosis, a rare autosomal recessive disorder, results from the deposition of hyaline material in the skin, mucous membrane and different organs of the body resulting in a multitude of clinical manifestations. 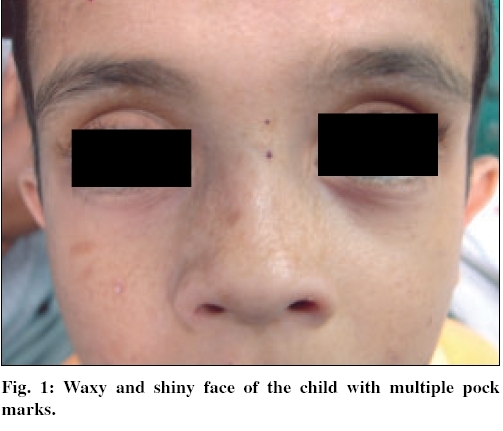 Here the case of a 12 year old boy, of non-consanguineous parcentage, with classical beaded papules along the eyelid margin, waxy facial skin and a history of repeated skin infections that left scars over his face and body. Apart from hoarseness of voice he had no other systemic manifestation. No other member in his family was involved. A three and half years old female child with lipoid proteinosis with no history of parental consanguinity and affected siblings has been reported here. The patient presented with complant of delayed healing, persistent oozing lesions which is quiet unusual as compared to that of hoarseness of voice which is usually the presenting complaint. The role of inheritance of susceptibility in lichen planus was studied by genetic analysis of data from 71 families of probands with lichen planus. 12 families were multiplex and the other 59 were simplex. The incidence of the disease among relatives of probands was significantly higher than that in the general population and the frequency diminished with the descend in the degree of relationship between relatives and probands. Pedigrees of the families of probands did not consist of any single-gene inheritance. The results shown by the curve of liability of the relatives, the frequency in the first degree relatives and the relative frequency points to a polygenic-environmental interaction. The heritability of liability for lichen planus which measures the relative contribution of genetic factors in etiology was found to be 56 percent for first-degree relatives. The etiology of lichen planus is still not properly known. Several pathogenetic theories have been proposed despite limited supportive evidences. 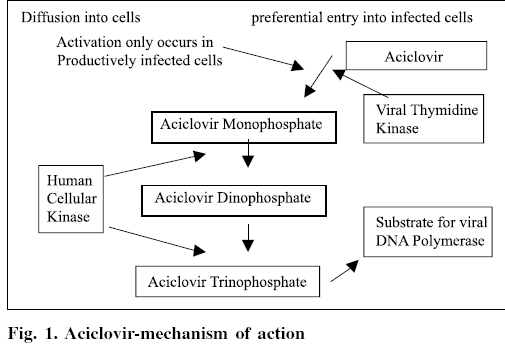 The main theories are: infective, autoimmune, psychogenic and genetic. The aim of this work is to throw a beam of light on the genetic role in the pathogenesis of lichen planus.